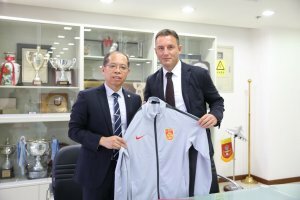 At the end of September 2018, Serbian manager Aleksandar Janković signed a two-year contract with the option to extend for another year with the Chinese Football Association to lead China U-19s. 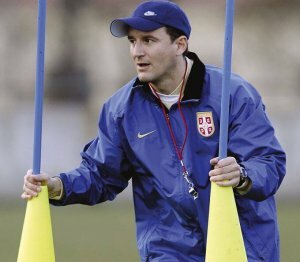 This is a new step in the 46-year old’s career, who is best known to the Serbian public as the “child” of Red Star – as a player he represented the red and white in every single youth selection and, upon moving to France, he met Slavoljub Muslin who showed him how to love coaching. An injury to his knee meant he had to end his playing career and he found himself in the dugout before he turned 30. 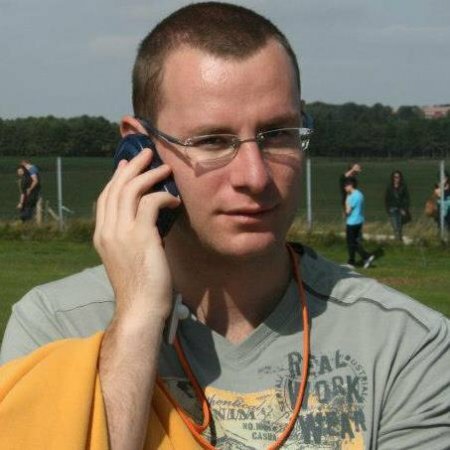 He was Muslin’s assistant at Red Star, PFC Levski Sofia, Metalurg, Lokomotiv Moscow and Lokeren, and he landed his first job as a head coach with Red Star in the 2007/08 season. Next, he managed Lokeren, spent three years leading Serbia’s U21s, returned to Red Star for a short spell in charge, but the most impressive results came while he was at the helm of Mechelen. He then moved to Standard Liege, then back to Mechelen, then following an eight-month break he went back to coaching – this time in China. What were your initial impressions after the first few months in China, were you pleased with what you found? My experience has been outstanding since this is a new chapter in my life and a completely different challenge compared to anything I’ve embarked on so far. In the beginning, I took a couple of trips to China to check out a decent number of players and matches. I spoke with coaches too, they’re coming from different cultures – there are many Spaniards, Italians, Japanese… They all have their unique understanding of the game and you can see what their demands from the boys are in the way their teams play. They also have different training concepts and it was nice to experience all that. I used the information I obtained to make the squad list for the first round of team’s preparations in early January in Australia. What did the communication with the players who made the squad look like at first? I had been observing them, initially I didn’t communicate with them directly, but with their coaches. The team that played in the AFC U-19 Championship failed to qualify for the FIFA U-20 World Cup, but they will be the backbone of my team regardless. I chose player profiles that I find attractive with regard to my future demands from them. There are modern and interesting profiles which will motivate me in the coaching sense. There is a stereotype around – Chinese players are disciplined, but tactically inept. Is there any truth to this? Foreign coaches have become very influential in China, homegrown coaches are all but gone. There’s space for improvement of course, but as I said already, you can tell the coach’s philosophy by observing the players. Spanish coaches, obviously, insist on keeping possession and positional play when attacking. Italian coaches are defensively oriented, with great discipline in defensive block and the desire to execute attacks quickly. With Japanese coaches, discipline is essential, as well as lively and brisk coaching that is also extremely demanding at all times. It will take some time for my ideas to become accepted, but there is a strong work culture in China, with a refined attitude towards authority and a strong team spirit – this is a solid foundation on which you can work on. To what extent were you able to familiarize yourself with their football system and the way it works? I briefed myself in-depth – I signed my contract in October and we were in contact since May. My first association to football in China, much like most people in Europe, was huge sums of money, big names from European and world football going there and not sticking around, returning home with their pockets full. However, the situation there is more nuanced – of course the budgets are large, but this is also reflected in the top class infrastructure and other conditions for work. For example, as a U-19 coach I am not constrained to FIFA’s and international calendars which allow you to spend only about 10 days with the team. If I see that the team needs to spend a longer period of time together, I will get the green light from the clubs, which is very important to me. I realized there is a big difference in their potential and current results, this helped me made up my mind when I chose this job. In this space I can see myself, my work and opportunity for this team to make progress with me over a period of two years, which is how long my contract will run. How do you feel about the team’s preparations in Australia? The trip to Brisbane was top class, without a single hiccup in organization of practices and matches, even though we spent almost a month at the camp. This enabled us coaches, players and everyone else helping the team to focus on work exclusively. Even the results came instantaneously, although they weren’t a priority, against tough and physically dominant Australian sides. We set the foundations and the basic principles, demands with regard to mentality and attitude, we’re all on the same wavelength and this brings huge motivation to the team. This also makes us eagerly anticipate the next gathering. We are building on truly solid foundations. We do not play a single competitive game in 2019, which doesn’t mean there will be room for idle spells in terms of intensity and pressure. When there’s no pressure, I manufacture the pressure myself and set goals even when we’re not playing competitive matches. I asked the FA to put us in a tournament in Toulon early in June, a tournament with some of the strongest national sides in the world. We’re spending February and March in Spain and Italy, and in May we will probably go to Serbia, which means this tournament in Toulon would be culmination of the work we put in and an opportunity to observe how my players respond to different circumstances. My primary goal is to set up a coherent system and form a subsystem with selections younger than ours. I managed to achieve that in Belgium, and up to a certain point in Serbia with their U-21s in 2011 and 2012. I now want to do the same in China – throughout the course of 2019, the idea is to pick through this large group of players and then compete in a big tournament in 2020 with the aim of getting a noticeable result. I expect some of my players to get call ups from the national team. This means I will need to use the same criteria to bring new players to the team in order to stay ready for these departures. In short, the goal is to set up a system which produces players for higher levels but which also regenerates instantly from its own pool of talent, while making sure the results don’t suffer as a consequence. When I first started setting up the subsystems, it was a complex undertaking. I would pick some first team players, some from U-21s, U-19s, U17s and U-16s as well as all the coaches, and we would all be working together. On Mondays, we’d have a briefing on what happened over the weekend and watch videos of all of their games together. We would also conceptualize the practice sessions for Thursday afternoons, when we’d have the whole club on the pitch. Everyone worked on corrections together. We would also pay visits to schools, track their grades and restrict them from coming to practice if they slipped at school. Then we would bring in first team players to U-16s and U-17s practice sessions – at Standard Liege, I would bring Eyong Enoh, who was 32 at the time with almost 100 games under his belt in the Ajax shirt, for practice sessions with the kids. Then these kids would watch our first team from the stands with their parents, while Enoh would wave at them: “This is my buddy Eyong.” This is priceless, but you need to have awareness of your role and use your position to choose the suitable people for such an atmosphere and such a system. This is why at Mechelen we were able to sell Sofiane Hanni for two and a half million even though he arrived on a free, and I could immediately turn to a developed young player from our youth selections. I never ask for anything I don’t stick to myself, neither from my staff nor my players. The entire project was extremely complex and I am happy to have achieved something in such a demanding footballing setting like Belgium. The next moment I was approached by the Chinese FA who knew all about my footballing philosophy of which I never spoke to anyone – now that’s the ultimate recognition. The public was not familiar with all the extra work we put in… I didn’t want to score cheap points with the fans and reasoned the best answer to all of their questions is to set up a healthy system and introduce young players. And that is exactly what happened. How would you define your footballing philosophy? I was brought up by an attacking club, which means my human nature and footballing philosophy were always going to develop in that direction. It’s difficult for me to put it to words, you should ask the Chinese FA what made them approach me, bring me here and insist that I am their guy. Essentially, I demand discipline in play, using possession of the ball to dominate and control the rhythm, a decent organization with respect to everyone’s commitments and team spirit, because it is the team spirit that elevates individuals. I want my players to commit fully without hesitation. I want to contribute to developing China’s footballing identity. Japan are a technical side which seeks to control matches and ball possession, South Korea are an aggressive side with exceptional team and fighting spirit and they press a lot. When I asked what makes China’s footballing identity, I didn’t get any answers. So this is a huge motivation for me. This situation reminds me of when I took over Mechelen, a club without rating at the time, which finished the season as 13th in the table and played in the old British “kick & run” system. In time, the team acquired a completely different profile built on the principles I’ve lived by all my life. What are the principles you introduced at Mechelen? Putting the team above everything as a category of utmost importance – deferring to the team while still maintaining the qualities and characteristics of each player. By working hard, despite disturbances, we succeeded in changing our identity – we played the possession game, we were in control in a vast number of matches, in 90% of the matches we had over 50% possession of the ball, which gave us more shots on target, chances and goals. All of that, while, I repeat, preserving the team spirit which brought about a fanatical approach to defending. Such an approach takes time, but all the players benefited from it personally which incentivises me. My philosophy found its application there – the club turned an investment of 350,000 euros in four players into 27.5 million from transfers alone. A switch in philosophy produced players who are capable of performing for the big clubs. My greatest vindication was learning that in the period from 2014 to 2018, Mechelen had realized transfers of three players to Anderlecht, another three to Club Brugge, a coach, a goalkeeper and a sporting director to Standard Liege, as well as the transfer of a player to Ajax. Such data shows the demands from our players were in line with the demands from the big clubs. This poured in 30 million euros into the club. The money was used to build a new stadium. Just to give you some perspective, last time a player moved from Mechelen to Anderlecht was in 1989. How hard was the process to implement your philosophy into the players’ heads? There are emotionally heavy and bitter phases, with many unpleasant conversations, but after that there will be lifelong friendships and great mutual respect. This is typically the case with the players who have huge potential, but haven’t been able to express it. The great master Dragoslav Šekularac used to say how his father didn’t have a clue he had been playing football until he was 15, his father only found out once he received a call up for the national team. This is all but impossible today, some steps tend to get skipped while growing up, which means humility, self-criticism and self-analysis wane too soon in young players. Surrounded by parents and agents, who are too often overambitious and out of touch with reality. This way a player is unable to properly analyse his performance which is why he never learns to question and re-examine himself. I’d help players who are getting nowhere in their career, to view themselves realistically and evolve both as footballers and as human beings. I don’t sit for a coffee with my players, I don’t have that type of relationship with them, but it is the type of relationship where they know they can give me a call me at 2-3 in the morning, good or bad. I had a brilliant player, an Algerian formed as a player in France – Sofiane Hanni. He arrived to Mechelen as a classic French number ten formed at Nantes, with very few minutes under his belt before moving on to Turkey. He played in Turkey for three years and arrived to Mechelen on a free. He had this attitude, everything should revolve around him, and I was committed to fulfilling his potential at all costs. We were doing corrections at the time and after three-four games I invited him to have a talk with me. He would say he played OK, but wasn’t getting any service, not enough good balls to him and such. Then I listed a number of things that were far from “OK” – he wasn’t winning any duels, he couldn’t keep the ball… I had a guy on the bench keeping stats, some of them you can’t even find on Instat and Wyscout, and even these stats weren’t good enough. Then I printed a list of players who played in that game, writing down the number of duels and duels won below each name and placed the list in the dining room, so everyone could take a look. Every single player had over 50% duels won, including the attackers and wingers – Sofiane had 9% duels won, and he said he had an “alright” game. I asked him, in front of everyone, if he feels ashamed to dine with the players who are giving their all on the pitch, while he won only 9% of his doels and thought he was doing well. Hearing such things can hurt, because nobody ever told him that, but this was his reality. After he held a grudge for a short period of time, it was wonderful to work with him, the real thing. He scored 17 goals as a midfielder during that season of brilliance which introduced us all to the big stage. Sofiane moved to Anderlecht, next season he became their captain, and nowadays he’s with Spartak Moscow. We kept a strong bond. Communication with players is obviously one of the most important aspects in coaching. You spoke about young players not being able to see themselves realistically and ignoring critics. How did you get them to change their perspective on life and football? tra visit from family members. This was a huge prize for them, so I told my players: “Now you go ahead and try not to care.” There’s so much money in football which gives them unrealistic perspective on life. It is much easier for them to think highly of themselves and lose humility, so a cold shower in form of a trip to prison can make them remember what’s essential. 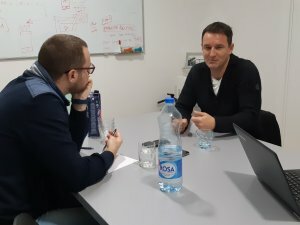 In the second part of our conversation with Aleksandar Janković you will read about how to set up a hierarchy in a football team, how to recognize leaders, what are the main differences in the roles of a head coach and an assistant coach and what you can focus on when doing video analysis. We also spoke about Slavoljub Muslin and the emotional baggage that comes with managing Red Star twice.